My client brought me a snippet of hair from her dad (who had passed away recently). 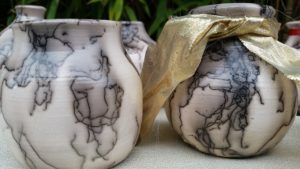 She requested I make a set of Vases she could give away to family members as gifts. I used his hair to create these whimsical art Vases, and my client was very happy : ) She cried when she unwrapped each one, and reported back that her family LOVED these little Vases honoring her dad! These prices all includes shipping. Just mail us a snippet of hair and we do the rest. 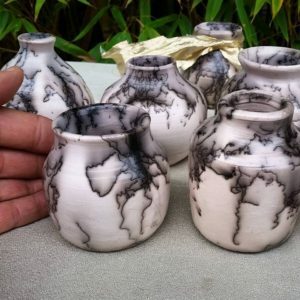 My client ordered 8 Vases and everyone was unique. 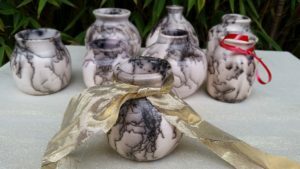 Using a snippet of hair from my client’s dad, and our Raku firing process, these 8 whimsical art Vases were created. The project is a co-creation between my client, her dad’s hair, and my artistic abilities. 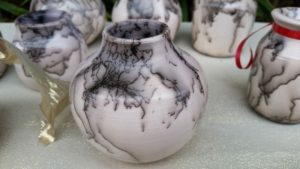 You can clearly see where the hair made it’s unique ‘drawing’ on the handcrafted and hand-thrown white clay Vases.